Next up is the latest game from Dark Souls developer FromSoftware called Sekiro: Shadows Die Twice. Set to launch in 2019, the samurai-based game will be published by Activision, a first-time partnership for the studio. Gameplay looks to be reminiscent of past FromSoftware series like Tenchu, Dark Souls, and possibly Kuon. Bethesda’s Todd Howard took the stage to unveil the first footage of Fallout 76, which is a prequel to all other games in the franchise and is “four times the size of Fallout 4.” Again, no gameplay was shown despite rumours of a survival game ala Rust or a multiplayer focused Fallout. From Dontnod Entertainment comes The Awesome Adventures of Captain Spirit. This free downloadable game will be available on June 26 and takes place in the same universe as Life is Strange. Making its debut on the Xbox stage was Kingdom Hearts III hot off the announcement of its January 29, 2019 release date. The new footage included looks at both previously unveiled Disney worlds, as well as a brand new look at the Frozen world, which seems to be set during the events of the movie. Rare’s online pirate simulator Sea of Thieves has two new pieces of DLC coming out before year’s end. Both expansions were teased in the above trailer, with Cursed Sails and Forsaken Shores set to launch in July and September respectively. This year’s Forza title will be Forza Horizon 4, with Playground Games developing the open-world racing game. A focus on a shared world, online missions, and season-based gameplay where the time of year affects the gameworld and driving conditions. With these new studios under its belt, Microsoft’s first party studio number comes to eleven. 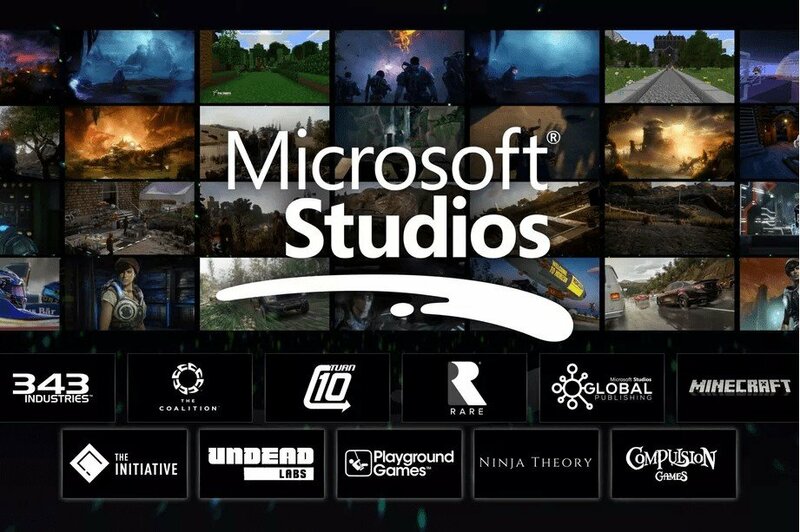 As part of a major expansion for Xbox, Microsoft has purchased five studios to be brought into first party development. These include a brand new studio led by ex-Crystal Dynamics head Darrell Gallagher called The Initiative, which is working on a currently unannounced project. Other acquisitions include State of Decay developer Undead Labs, Forza Horizon team Playground Games, Hellblade creator Ninja Theory, and Compulsion Games, best known for the upcoming We Happy Few. Capcom took the stage to unveil Devil May Cry 5, a full decade after its predecessor’s launch in 2008. The game seems to draw from both the traditional Devil May Cry games as well as Ninja Theory’s DmC: Devil May Cry. Microsoft ended the show with several world premiere trailers, all for games that had not been announced prior to E3. The first was Jump Force, which looks to be an anime crossover brawler featuring characters from Naruto, Dragon Ball, Death Note, and One Piece. Next up was Dying Light 2, the sequel to the original game that was getting DLC expansions as recently as last December. No release date was given just yet. The trailer and following presentation focused on the decisions made by the player and how that will drastically effect the world in which the game takes place. While a leak may have taken the wind out of its sails, Just Cause 4 made its proper debut on the Xbox stage as the conference started to wind down. Protagonist Rico Rodriguez makes his return at the forefront of Avalanche Studios’ wild open-world playground. Gears of War received a major spotlight in the eleventh hour, with three new games in the franchise announced by the show’s end. First up was Gears Pop!, a mobile game featuring Funko Pop versions of characters from the franchise. No gameplay was shown, but Android and iOS users can expect to see this collaboration on their devices in 2019. Second was Gears Tactics, a turn-based strategy game set 12 years before the events of the original Gears of War. Finally there was Gears 5, the next mainline game in the series. It will feature Kait from Gears of War 4 as a protagonist, with other returning characters acting as the player’s squad. Closing out the show was Witcher developer CD Projekt RED’s unveiling of the long-in-development Cyberpunk 2077. The trailer was exclusively cinematic material with no gameplay, but it is the first look at the game since its soft unveiling in 2013. Stay tuned to CGMagazine for all the latest updates from E3 2018. Check out or coverage of FIFA 19 and Anthem.